Virtually any disease that results from malfunctioning, damaged, or failing tissues may be potentially cured through regenerative medicine therapies, by either regenerating the damaged tissues in vivo, or by growing the tissues and organs in vitro and implanting them into the patient. 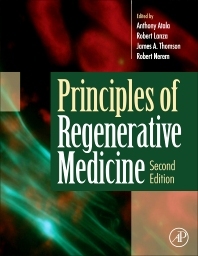 Principles of Regenerative Medicine discusses the latest advances in technology and medicine for replacing tissues and organs damaged by disease and of developing therapies for previously untreatable conditions, such as diabetes, heart disease, liver disease, and renal failure. Advanced researchers in bioengineering, stem cell biology, and developmental biology. Dr. Atala works with several journals and serves in various roles, including Editor-in-Chief of Current Stem Cell Research and Therapy, and Therapeutic Advances in Urology; as Associate Editor of the Journal of Tissue Engineering and Regenerative Medicine, The Journal of Rejuvenation Research, Nanotechnology in Engineering and Medicine, Gene Therapy and Regulation, and Current Reviews in Urology; as Executive Board Member or Section Editor of the journal Tissue Engineering and International Journal of Artificial Organs, and as Editorial Board member of the International Journal of Stem Cells, Stem Cell Review Letters, Expert Opinion on Biological Therapy, Biomedical Materials, Recent Patents on Regenerative Medicine, the Journal of the American College of Surgeons, the Journal of Urology, BMC Urology, Urology, and Current Opinion in Urology. Dr. Atala has led or served several national professional and government committees, including the National Institutes of Health working group on Cells and Developmental Biology, and the National Institutes of Health Bioengineering Consortium. He is currently an NIH “Quantum Grant” awardee. Dr. Atala heads a team of over 250 physicians and researchers. Ten applications of technologies developed in Dr. Atala's laboratory have been used clinically. He is the editor of nine books, including Minimally Invasive Urology, Methods of Tissue Engineering, Principles of Regenerative Medicine, and Foundations of Regenerative Medicine, and has published more than 300 journal articles and has applied for or received over 200 national and international patents. Robert Lanza, M.D. is currently Chief Scientific Officer at Advanced Cell Technology, and Adjunct Professor of Surgical Sciences at Wake Forest University School of Medicine. He has several hundred scientific publications and patents, and over 30 books, including Principles of Tissue Engineering (1st through 4th Editions), Methods of Tissue Engineering, Principles of Cloning (1st and 2nd Editions), Essentials of Stem Cell Biology (1st and 2nd Editions), XENO, Yearbook of Cell & Tissue Transplantation, One World: The Health & Survival of the Human Species in the 21st Century (as editor, with forewords by C. Everett Koop and former President Jimmy Carter), and Medical Science & the Advancement of World Health. Dr. Lanza received his B.A. and M.D. degrees from the University of Pennsylvania, where he was both a University Scholar and Benjamin Franklin Scholar. He is a former Fulbright Scholar, and studied as a student in the laboratory of Richard Hynes (MIT), Jonas Salk (The Salk Institute), and Nobel laureates Gerald Edelman (Rockefeller University) and Rodney Porter (Oxford University). He also worked closely (and coauthored a series of papers) with the late Harvard psychologist B.F. Skinner and heart transplant pioneer Christiaan Barnard. Dr. Lanza's current area of research focuses on the use of stem cells in regenerative medicine.